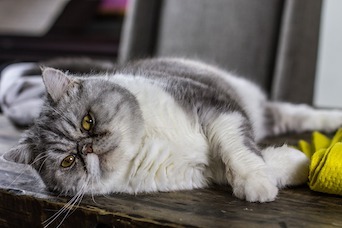 An Australian study examined potential relationships between body condition score, survival time, and lifespan in cats, with somewhat surprising findings. A recent study published in the Journal of Feline Medicine and Surgery investigated the possible association between body condition score (BCS) and lifespan in cats. The 9-point BCS scale is the most common method used to assess feline body composition, with relatively high scores suggesting overweight to obese status. A variety of health conditions are associated with obesity in cats, including hypertrophic cardiomyopathy, diabetes mellitus, and lower urinary tract infection. Investigators at the University of Sydney in Australia used VetCompass software to obtain patient records for adult cats that visited a single, feline-dominant practice at least 2 times over 10 years. They collected information regarding patient signalment, lifestyle, and health conditions. The first report of each cat’s maximum BCS value (maxBCS) was also recorded. Due to inadequate sample sizes, the study excluded cats with BCS values of 1 or 2 out of 9. The investigators then examined whether body condition was associated with lifespan and survival, which was calculated as the time from the first maxBCS recording until death. A total of 2609 cats visited the practice at least twice over the examined 10-year period. Fifty-two percent of cats were female, 99% were neutered, and 56% were recorded as mixed breed. The most commonly diagnosed health conditions were classified as oral (50% of cats), gastrointestinal (28%), dermatologic (27%), or urinary tract (26%). Cats first reached their maxBCS at a median age of 5.4 years. Most of the cats (85%) at the practice had a maxBCS of 5, 6, or 7. Survival data, which were available for 2281 cats, indicated a median survival time (MST) of 5.8 years after maxBCS was first recorded. MST was longest for cats with a BCS of 6 (7.0 years) and shortest for cats with low BCS values of 3 (0.4 years) or 4 (1.8 years). Median lifespan of all cats was 15.8 years. For cats that reached their maxBCS before age 3, those with low maxBCS values of 4 to 5 had a higher risk of shortened lifespan compared to cats with a maxBCS of 6. When maxBCS was reached in middle age (3-10 years old), the risk of shortened lifespan was highest in cats with extreme maxBCS values of 3 or 9. In general, lifespan was shortest for those cats diagnosed with neoplasia or diabetes mellitus. Interestingly, cats that were diagnosed with hypertension or musculoskeletal, oral, or upper urinary tract conditions had longer average lifespans compared with cats without these conditions. Based on the 9-point scoring system, cats with BCS values ranging from 6 to 8 experienced greater longevity than cats with lower BCS values. The study found that although obesity was associated with development of certain chronic illnesses, it did not impair average lifespan. Also, lean cats with BCS values of 3, 4, or 5 had a relatively high risk of shortened survival, perhaps due to acquiring illnesses associated with weight loss.